Bodybuilding.com has been around forEVER as one of the largest supplement retailers in the world. Very recently I’m sure Amazon has taken a big bite out of their business so they are competing by rolling out their own line of products. The products seem to be a little bit half-baked, if I’m using their pre workout as an indicator. As you know from my Signature Series review- I actually hated that product. So I was hoping this Whey Protein from Bodybuilding.com would be a breath of fresh air. Let me start by talking about the flavors. I bought one of each of the three flavors and made a shake using each of them. This overview is going to tell you what the best flavor is, and then let you know if as a whole, this is a good-tasting protein powder. What’s the Best Flavor of Bodybuilding.com Signature 100% Whey Protein? Vanilla: This flavor of the Bodybuilding.com protein is average but has some very interesting notes of flavor. I found the sweetness level to be good but not great. I think it could benefit from a touch MORE sweetness as well as a little bit more depth of flavor with regard to the actual vanilla. I’ll give it an 8/10. 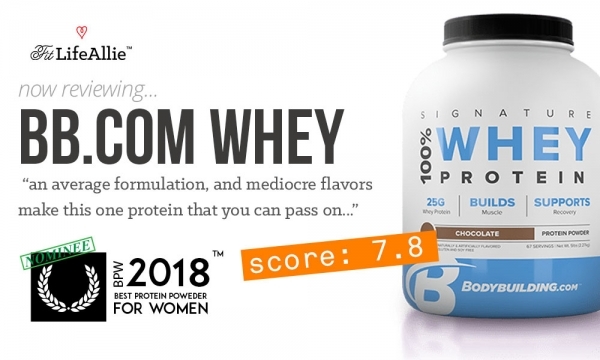 Chocolate: The chocolate flavor of BB.com Signature Whey protein was a little bit better than the vanilla in my opinion. I found the chocolate flavor to be deeper and more authentic than the vanilla. The sweetness level as okay but it needed to be, again, a little sweeter. This is more of a milk chocolate flavor than a dark chocolate flavor. Mocha Cappuccino: I love coffee. I don’t love coffee flavored protein powders. You guys know that. I think that the Signature Series Mocha definitely does taste like coffee, but the chocolate notes in this flavor taste a little bit artificial to me. I’m not in love with this flavor by any means. It was the worst flavor of the three for me, but, again, I don’t love artificially flavored coffee products and I’m not a huge Mocha fan. Overall I think that the Bodybuilding.com Signature 100% Whey Protein has average flavor. The best flavor is the Chocolate in my opinion, even though it wasn’t perfect. Let’s move on now to discuss the ingredients in this whey protein powder. What’s in the Bodybuilding Signature Whey Protein? Whey Protein Isolate, Whey Protein Concentrate, Whey Protein Hydroslate, Cocoa processed with alkali, Natural and Artificial Flavor, Gum Blend (Cellulose Gum, Xanthan Gum, Carrageenan), Salt, Sunflower Lecithin, Dipotassium Phosphate, Sucralose, Prohydrolase, Lactase, Acesulfame Potassium, Maltodextrin. Notes: The product is a combination of three different whey protein sources. YOu have your isolate, your concentrate, and your hydroslate. I personally think that combining these is smart to get the variety of different whey protein sources, but they don’t tell you what the exact proportions of each one are, so therefore it’s hard to really tell what the exact formulation is. The macros are rather straight-forward. Nothing to really note other than the cholesterol which is a little bit higher than in other foods. But that’s just the ‘whey’ it is. Lol. Get it? Let’s move on to the packaging now. The Bodybuilding.com Signature Series is not winning any awards from me in the packaging department. There are some things that they have done right, but for the most part, this branding and packaging is very tired looking. White, black, and light blue are the Signature colors of this brand but at the end of the day this product doesn’t look good. I think I said something very similar when I was reviewing the pre workouts. These products are just not that visually appealing. I think the white backdrop, while it seems like a good ‘wholesome’ look, just turns out looking boring. Drab, even. Bodybuilding.com is desperately in need of a refreshed brand as it is, and to have their Signature Series be basically a blown up version of that tired branding is a mistake. I give them a 6/10 on packaging. Okay let’s wrap this up.